LOS ANGELES, CA (February 13, 2018) – BOOM! Studios announced today thatFIREFLY, bringing the iconic worldwide pop culture phenomenon back to comic books in partnership with 20th Century Fox Consumer Products, has sold out of FIREFLY #2 SECOND PRINTING and FIREFLY #3 at the distributor level before arriving in comic book shops. 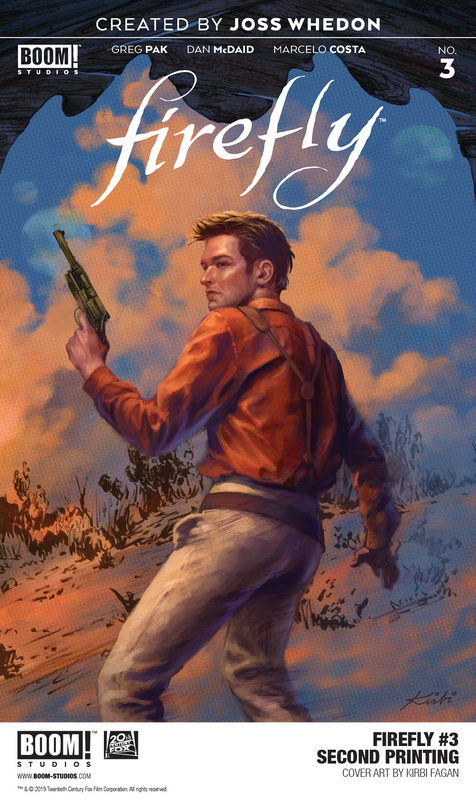 To meet this overwhelming demand from fans, FIREFLY #2 THIRD PRINTING VARIANT with a cover by Lee Garbett (Skyward) and FIREFLY #3 SECOND PRINTING VARIANT with a cover by Kirbi Fagan (Star Wars: Han Solo) will arrive in stores on March 13, 2019. New York Times best-selling writer Greg Pak (World War Hulk, Mech Cadet Yu) and artist Dan McDaid (Judge Dredd), along with series creator & story consultant Joss Whedon (the visionary writer/director behind Buffy The Vampire Slayer, Marvel’s The Avengers, and more), tell the definitive story of the Unification War, the intergalactic civil war that divided friend and family alike. Mal thought he could outrun his past, but when a simple mission goes wrong, he’s forced to confront it in the form of the Unificators, mercenaries deputized to hunt down war criminals. . . and they’ve got Mal and Zoë at the top of their list! War can make villains of even the best men, and Mal’s quest for redemption will put him at odds with his own crew, forcing him to make a choice: fix the past or fight for the future. 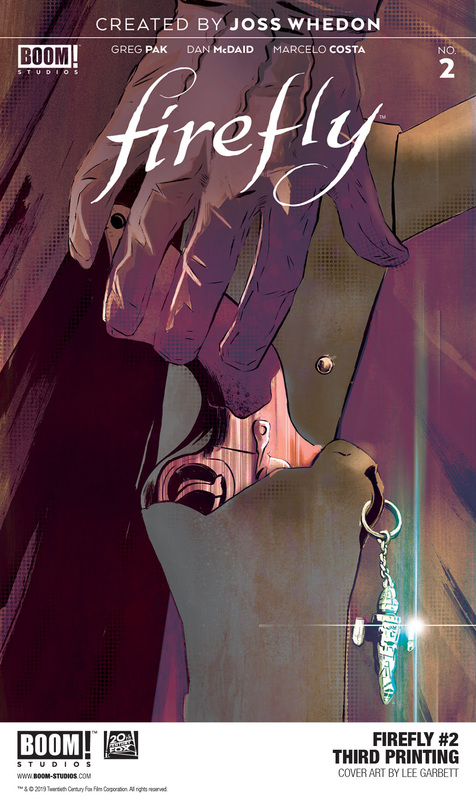 FIREFLY #2 THIRD PRINTING VARIANT and FIREFLY #3 SECOND PRINTING VARIANT are available exclusively in comic shops (use comicshoplocator.com to find the nearest one) on March 13, 2019. Also available in comic shops, FIREFLY: LEGACY EDITION BOOK ONEcollects previously released Serenity comics for the first time under one cover in a new value-priced format as Mal & the crew ride again in these official sequels to the critically acclaimed Firefly television series and Serenity film.